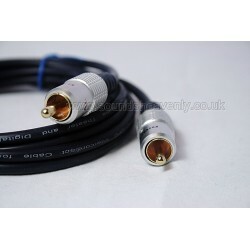 This product is a professional quality stereo RCA interconnect cable to allow you to connect from an AV processor or pre-amplifier with variable volume pre-out sockets directly to your B&O Beolab active speakers. One cable will connect two speakers to your music system or receiver. Important note: This cable is for connection to AV processors and pre-amplifiers only! Other devices generally use Fixed level Line out - this cable is only suitable for variable/ volume adjustable outputs. If you are trying to connect from a different device such as a TV or receiver please see our "Minijack to BeoLab cable" linked in the related items panel. Alternatively if you wish to connect BeoLab speakers to an integrated amplifier or power amplifier, please use our "Attenuator kit" to avoid damaging the speakers. If you are in any doubt, please ask! It may also be used with older BeoLab speakers that have displays (such as Beolab 3000, 4500, 5000 and Penta), but the displays will not function. We have many variations of cable for B&O BeoLab speakers allowing you to connect them to almost anything you want! Browse our entire range to find what you are looking for. For Beolab 3000, 4500 and 5000 wall-mounted speakers, you may need to undo the small screw that hold the cover of the RCA plug in place using a screwdriver and slide the cover off the RCA plug so that the plug fits the tight space behind these speakers - please ask if you need any help with this, or please ask if you would like us to do this for you prior to shipping the cables.